In fact, come to that, I may simply never look at Pac-Man again. It's just too horrifying. Zach Weiner's Saturday Morning Breakfast Cereal comic crosses the generation gap between an arcade-loving man and a desensitized modern-day kid. Arcade games? Boring? Oh no. Arcade games are terrifying. "Pacman," the man explains, "is the story of a man who wakes up one day to find he is nothing but a mouth." And the ghosts? They envy the living, and their ability to eat. The sordid tale creates a whole new level of 8-bit existential horror. Maybe the horror movie interpretation isn't so far off, after all. Now if you'll excuse me, I need to go play something less creepy for a while to clear the horror away. Like BioShock or maybe Resident Evil. 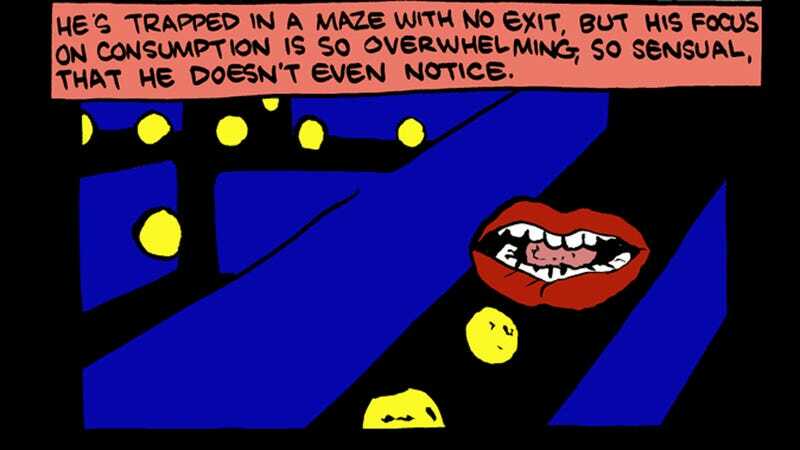 Scroll down or hit up the site for the full comic, but just know that it may ruin Pac-Man forever for you, too.